My husband and I have a spare room in our basement and I have been meaning to give it a much needed facelift! With some new paint and a few finishing touches it is looking a million times better! The only problem is that with it being in the basement, I felt like the room needs some color to brighten it up. Because the wall color is so neutral, I decided to add a little color with some fun nightstands! I love the Ikea HEMNES Chest with two drawers. It is absolutely perfect for a bedroom and offers plenty of storage space. I got one for each side of the bed and can’t wait to show you how great they look in the finished guest room! I was recently browsing Pinterest, when I came across the best idea ever. I found a company called O’verlays that makes the most darling decorative fretwork panels that easily attach to furniture, mirrors, walls and glass. The fit perfectly with so many Ikea products and I knew it would be the perfect way to add some character to my nightstands! I removed the hardware from the drawers then used Chalk Paint® Decorative Paint by Annie Sloan in the color Emperor’s Silk. I simply rolled two coats of Chalk Paint® on the drawers, table and O’verlays. I used a roller to avoid any brush lines and a brush for all the hard to reach places. I love using Chalk Paint® because you don’t have to sand the furniture before and it dries so quickly and evenly! You can read more about using Chalk Paint® here. I love this pattern and the texture it adds to the drawers! After the paint was completely dry, I drilled a hole in the middle of the O’verlay where the hardware for the drawer would go. Next, I attached the O’verlay by using Elmer’s Spray Glue (I tried brushing on wood glue, but it was too runny and ran out of the sides of the O’verlay….so don’t do that!). Just spray a light, even layer of the glue onto the back of the O’verlay and immediately attach it to the front of the drawer, being sure to line up the drilled hole for the hardware. 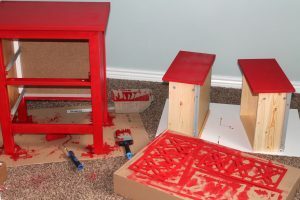 After the glue has completely dried, reattach the hardware and put the drawers back in the nightstand! In just a few hours I was able to completely transform my nightstands! Stay tuned for the rest of my guest bedroom makeover! Love the idea of the overlay! I'm looking for a used dresser I can paint and use in my guest room. I'd love to find something I can Use an overlay on. I love this idea! So perfect for guest rooms. Totally pinning this one! Hi Brittany, we have been having some server problems and all of our pictures aren't showing up yet. Hopefully it will be fixed soon. Thanks for your patience! Do you purchase the white or white satin hemnes? Noticed there was a difference in the choices to purchase but wasn't sure if it made a difference in painting. Thanks! Love the overlays idea, thanks! Unfortunately I bought my hemnes furniture back when white didn't come in stain, so it's made of different material than the other colors. I'm trying to find out if chalk paint will stick to the ones I have. I've had them for about 7-8 years and they are starting to develop a yellow hue in some areas, time for a revamp. So beautiful! So smart and creative! Could you also switch the knobs? Not sure how that works on ikea furniture? I’m pretty new to this type of stuff! If the knobs are the right size, you could definitely switch them out.